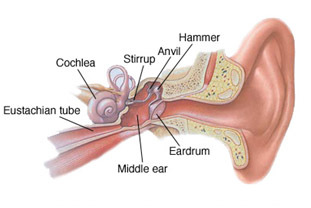 The middle ear consists of the eardrum (tympanic membrane) and an air-filled chamber containing a chain of three bones themalleus,incus,andstapes that connect the eardrum to the inner ear. The middle ear acts as an amplifier of sound, whereas the inner ear acts as a transducer, changing mechanical sound waves into an electrical signal that is sent to the brain via the nerve of hearing. Inflammation of the middle ear in which there is fluid in the middle ear accompanied by signs or symptoms of ear infection. 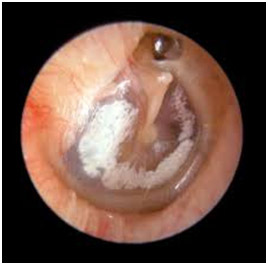 The Eustachian tube is shorter in children than adults which allows easy entry of bacteria and viruses into the middle ear, resulting in acute otitis media. Bottle feeding is a risk factor for otitis media. Breastfeeding passes immunity to the child that helps prevent acute otitis media. A cholesteatoma is a non-cancerous skin cyst that develops in the middle section of your ear. It may be congenital—meaning that you were born with it. It can also be caused by repeated ear infections. 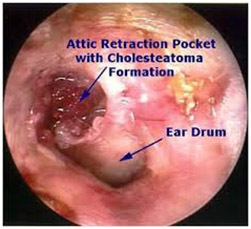 One cause of persistent and recurrent drainage from the ear is in many instances a cholesteatoma; a disease characterized by the presence of skin within the middle ear and or mastoid cavity. Not uncommonly this results in erosion of the ossicular chain, (malleus, incus and or stapes) thus increasing the hearing loss. The labyrinth or the inner ear structures causing severe to profound hearing loss and severe vertigo (a balance disorder). It also may result in facial nerve weakness or paralysis. Again, this is not a tumor but rather a disease process that acts locally much as a tumor does. A hereditary disorder causing progressive deafness due to overgrowth of bone in the inner ear. 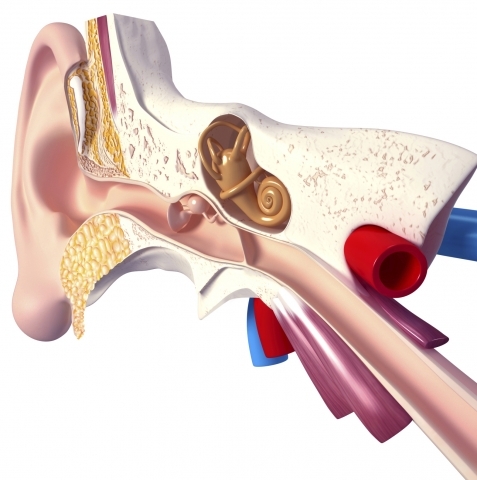 People who have otosclerosis have an abnormal sponge-like bone growing in the middle ear. These vibrations are needed in order for you to hear. Otosclerosis is the most common cause of middle ear hearing loss in young adults. It typically begins in early to mid-adulthood. The condition may affect one or both ears. Commonly it does not have an equal onset time frame in each ear when it does occur bilaterally. Bezold’s abscess is an abscess (a swollen area) in the Sternocleidomastoid muscle containing an accumulation of pus. Tympanosclerosis is a condition caused by calcification of tissues in the middle ear, sometimes resulting in a detrimental effect to hearing. 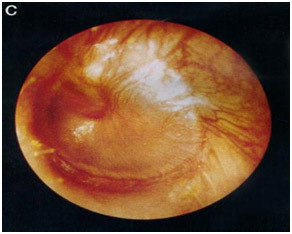 White patches on the middle ear or tympanic membrane. What are paragangliomas (glomus tumors)? 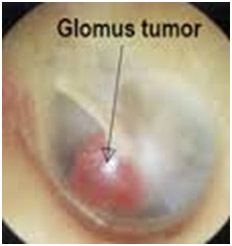 Paragangliomas are also called “glomus” tumors. These are usually benign, slow-growing but highly vascular tumors that cause symptoms by their. Secretion of hormones, which is rare. As they grow, their mass effect can block sound transmission in the middle ear, causing conductive hearing loss. Rarely, these tumors can produce hormones such as adrenaline, which can cause episodes of sweating, flushing, headache, and a rapid heartbeat.